For those of you who don’t know this show, it basically consists of teams racing around the world doing many adventurous activities. It’s one of Kristen’s favorites (she is bummed about missing the upcoming season), and surprisingly, we don’t remember them ever racing in Colombia. Well, they are missing out because this town seems to be ready made for their crazy tasks and challenges. 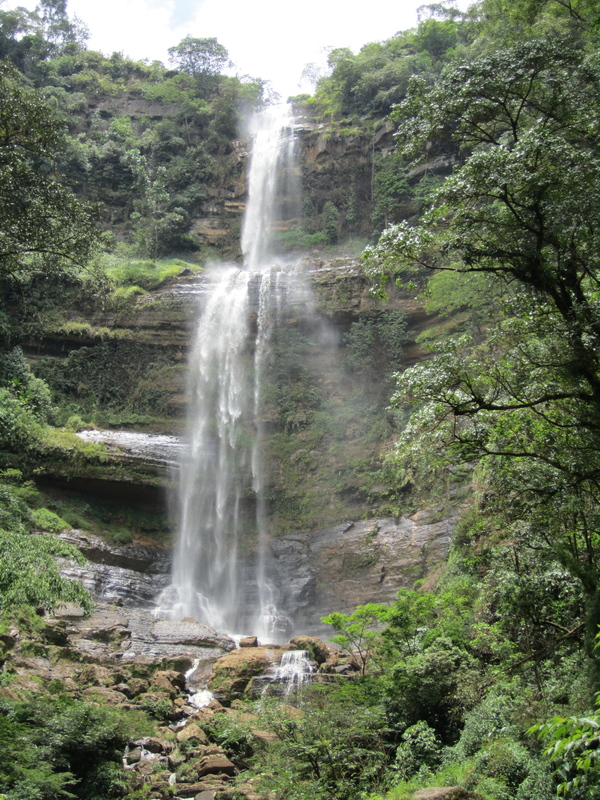 Seriously, producers of Amazing Race, take note: Colombia is ready for you! 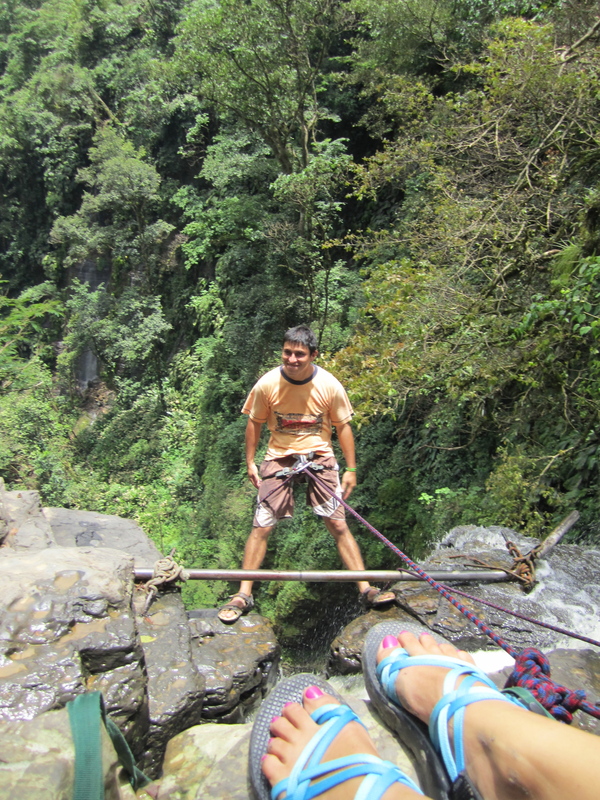 We started our own “Race” by signing up for an “easy” rappel down a 80 meter waterfall. Doesn’t sound too scary in metric does it? However, 80 meters is just over 250 feet, something we didn’t put together until after agreeing to this task. Had we realized that this was basically like rappelling down an over 20 story building, we might not have gone so willingly. 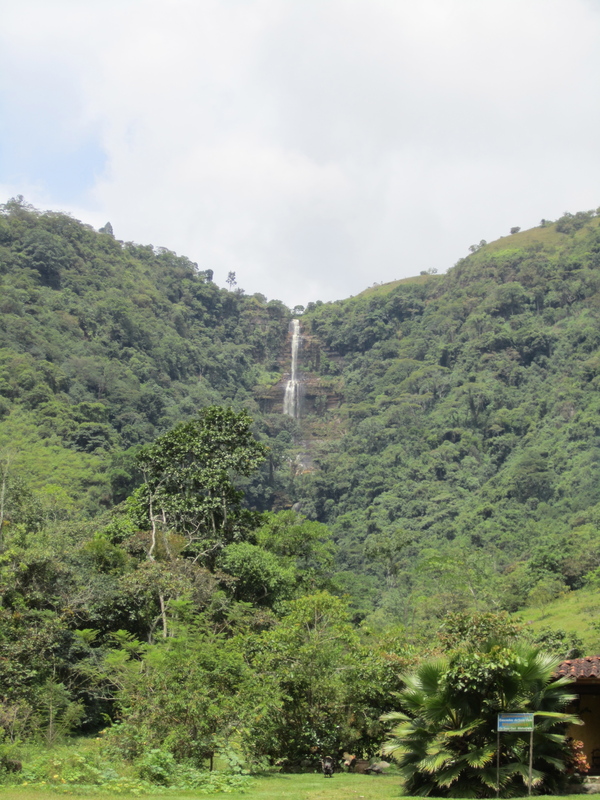 We bused to the waterfall and met our guides and fellow “rappellers.” We had an enjoyable 30 minute hike to contemplate our lives and enjoy the jungle scenery before embarking on the rope. We arrived at the waterfall and it was HUGE. Luckily, we were only rappelling down a relatively small section of it. After what seemed like hours peering over the edge while the crew set up the lines, it was time to go. By some cruel twist of fate, Kristen ended up with the best Spanish (that’s not saying much) and ended up playing translator. We were given a safety briefing all in Spanish, of course. 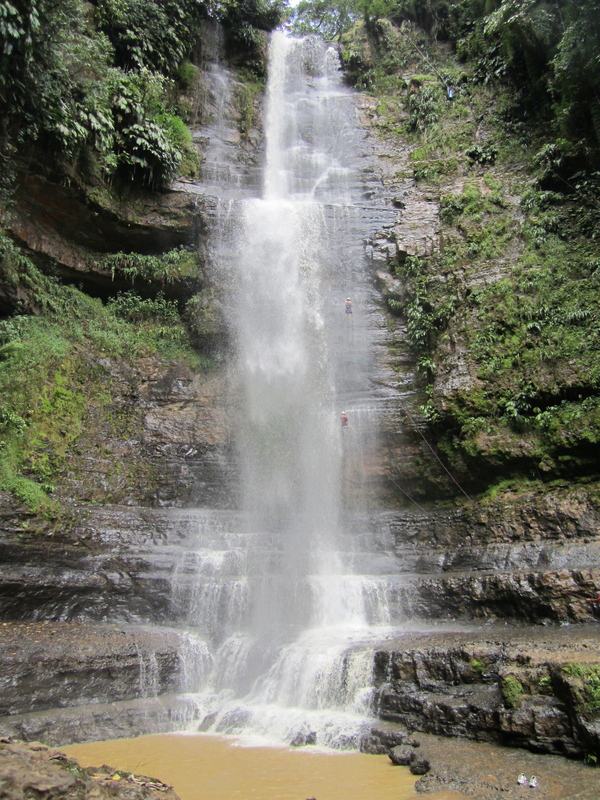 Nothing quite like asking yourself, “Now, what did he say?” before jumping off a waterfall. We were first to go, so we would be the ones to pay for any mistranslation. We were strapped in, and with some hesitation and excitement we slowly stepped backwards, closer and closer to the edge of the cliff. The palms started getting clammy and the butterflies fluttered in the stomach. The initial leaning off the edge was the scariest part, but once you realized how secure and somewhat safe you are, the ride down became exhilarating. It wasn’t like a free-fall; you actually had to exert yourself to move downwards. With the birds eye view of the jungle and the water falling on our heads, this was a new and unique experience for us. We both loved every second of it and can’t wait to do it again. Had this been a “Roadblock” on the Amazing Race, we would have definitely made up some time here. 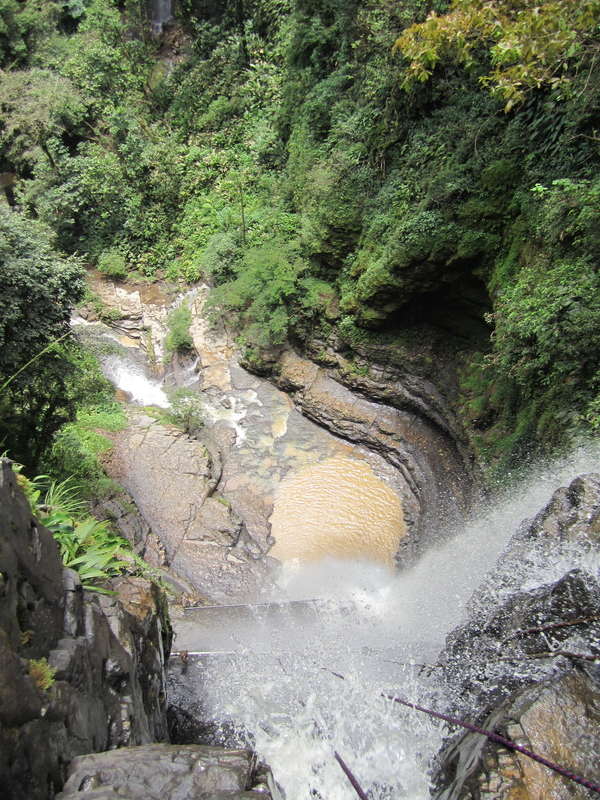 Still to come in our San Gil Race: caving and eating the biggest ants we’d ever seen. Love it!!!! I’m jealous! I’ll try & sign u guys up for the following season!!! Looks like fun! It has been fun, but I think Joe and I wouldn’t do so well on the real show. I don’t do so well under pressure and tend to stress out (just a little). Good thing you decided on the Chacos…I haven’t seen a flip-flop hike yet! We have done a few flip-flop hikes, but we definitely have put our “sporty” shoes to use! I am so glad you can’t post all of your adventures until AFTER you have SURVIVED them, hopefully uninjured. Sure enjoying the vicarious thrill. Omg scary!!! I can’t believe you did that! Are you guys kidding me?! Awesome! So glad you took the time to be sure you understood all the safety instructions! Looks like an absolute blast. Gotta love the Spanish instructions. Good enough will be fine, I’m sure. 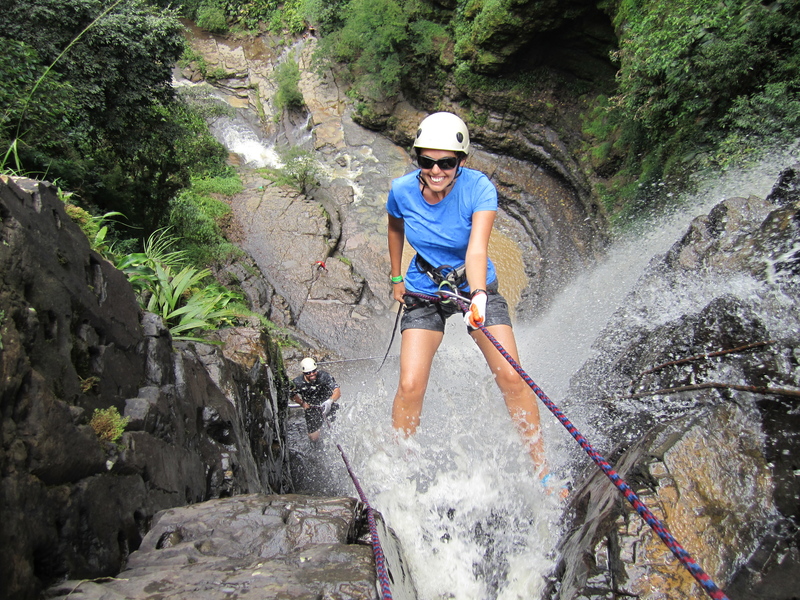 Rapelling down a waterfall? Sure. Entering a mysterious tunnel fully underwater? I don’t think so. Glad you guys are enjoying such adventures! P.S. There is a video posted on my Facebook Wall of Jordy’s birthday if you guys want to see it.